This is a fun beachy style is done with a great shell accent and the bride and gooms first initials as a monogram style design around it. We used some more modest fonts but this would look great with some great fun fonts as well. the set shown was done in a white and emerald green color palette, but it is customizable to whatever your palette is, images are just to show an example of the set. 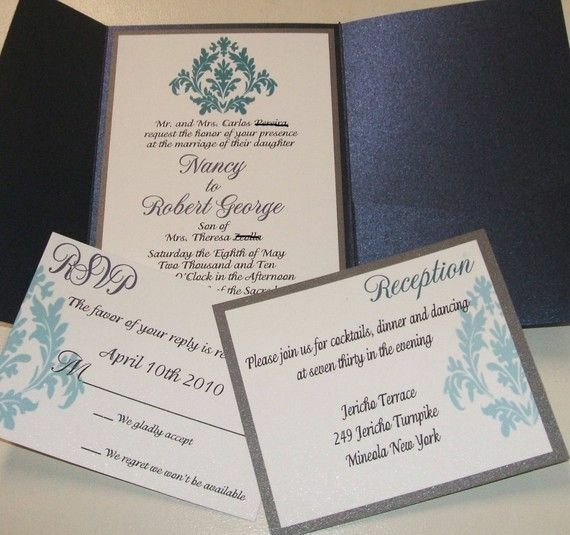 Wording, font style, colors, even layout is customizable to make them all yours as special and unique as you and your day is. The set shown was printed on a standard matte cardstock but it can be printed on a linen textured cardstock which would be very pretty and add a bit more of that natural beachy feel, we could also do a cool rafia style wrap to hold set together, just a couple of ideas. If you love this design but do not need the listed qty. please drop me a convo we can do any qty you will need. Thank you for stopping by my little shop and I look forward to talking with you more about your stationary needs.